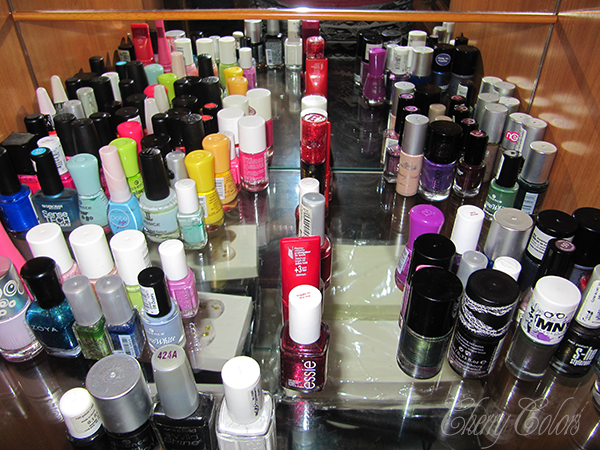 Organizing my nail polish collection - Cherry Colors - Cosmetics Heaven! 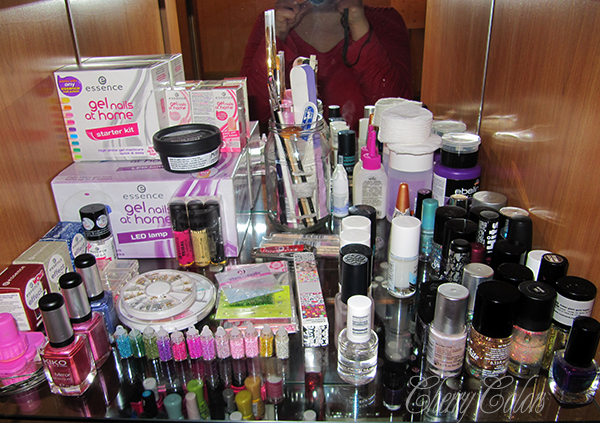 I was always asking myself "how can I organize my nail polish stash? ", but never seemed to find the answer. You see, I was lacking of a decent space to put all of the polishes in. My poor nail polish collection was stuffed all in one ugly box. It did its job, although it was heavy and I had a hard time picking a polish out of it. But after moving to a new place, I got a full closet to myself. One that is supposed to keep decorative items in (thus the glass shelves), and since my decorative items of choice are nail poducts.. so be it ;). My whole nail polish collection (& nail art) takes just 2 shelves. Incredible! Of course this after giving away 40+ nail polishes. Whoops ;P.
Let me show you the first part - nail art and nail items. 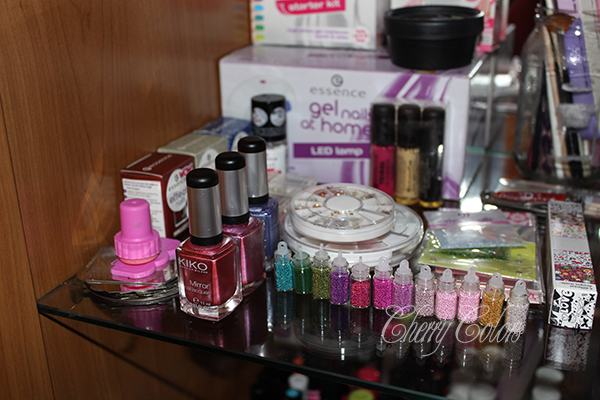 On the left there's some nail art supplies (glitter, rhinestones, pearls, stickers, stamping plates, beads, nail art polilshes, ...), in the back there's the essentials (gel nails at home set, another set by pieces, lemony flutter, UV lamp, nail files etc in a jar, nail glue, cuticle cream, cotton pads, nail polish remover) and in the front right row we have top coats, base coat (just one haha) and different toppers. Some of the toppers aren't really toppers, but are too sheer to be used alone (need 4 + layers for full opacity). See, there aren't many ;). I counted them and there are 80 of them. I organized them by seasons, since each season I am craving for different colors. So there's the Black and White part where I keep my white and three black polishes. No grays, since I don't own any. The reds is of course full of all sorts of reds ;). My favorite. Every Summer I crave for bold colors. Wild colors, neons, pinks, blues... this is where I keep them. Every Autumn I want browns and deep reds, maybe some nudes..
Winter is the time when I wear dark colors, blacks, and similar colors. Of course Spring is full of pastels and gentle colors. And a coral polish, just because. 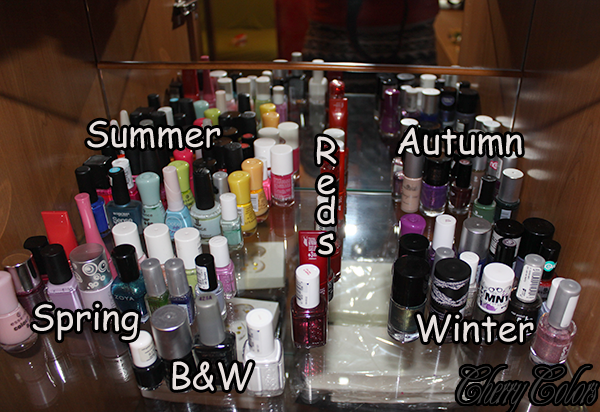 This organizing my polishes by seasons is a new thing for me. I try to stick to the polishes I set for that season or a season close (like Winter and Autumn), so I get to use the most neglected polishes. In the Winter part I put an all time goodie - the She holo polish that goes with everything. Just because I felt it should be used this season ;). 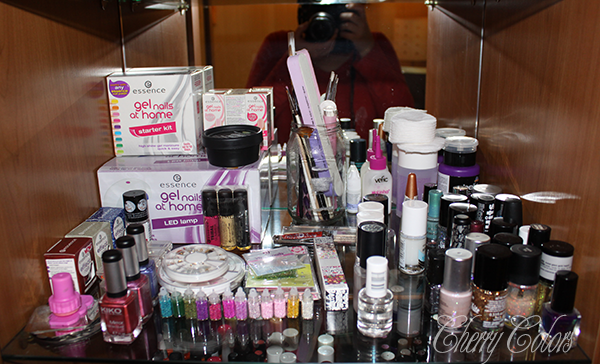 Dears, how do you organize your polish collection?